Alfa Spid rotator adaptors allow for simplified tower mounting of the Alfa Spid Big RAK, RAK, and RAU rotators. Bolt patterns for both Yaesu and HyGain. Base is 6” square and tube is 5.5” tall. Entire unit is precision MIG welded and hot dip galvanized for superior corrosion and weather protection. User provides hardware. Adaptor mounts inside base of rotator, secured with the bolts built into rotator. Introducting AlfaSpid antenna rotators! Manufactured in Poland by Spid Elektronik, these are robust rotators that work with nearly every model tower or even a ground mounted mast. Rotators are built around a steel housing (no pot metal, no aluminum), have a double worm gear reduction, and a simple DC motor with torque to spare. In fact, when comparing AlfaSpid rotators to other brands, the rotating torque and braking torque numbers are higher than other rotators costing twice as much. See comparison chart below. To successfully use an AlfaSpid rotator, you will need the rotator itself, a control box, 4 conductor cable, and a 12-24VDC power supply. AlfaSpid motors run on 12 to 24 volt DC at very low amp draw (2 amps running, 3 amps to start). They can be run from existing 13.8VDC station power supplies. if run at higher voltages the rotating speed is much faster. 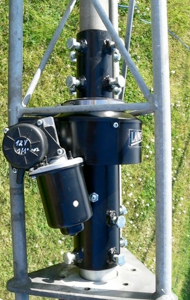 The unique AlfaSpid 'pipe mounting' system (see photos on the product pages) enables a wide variety of installation possibilities and thanks to the strength of the steel case many installs will not require an external thrust bearing. We also carry suitable high quality UV rated rotator cable. We offer bundle discounts on Antenna / Rotator / Controller / Tower / Cable packages - call or email us to discuss! •Low voltage - high torque DC gear head motor. •Rotating torque/speed: 1,400 in/lb. at 12v (120 sec) to 3240 in/lb. at 24v (60 sec). •Rotation of 720 degrees from stop to stop. •Quiet and powerful self-braking action with double worm drive reduction. •Steel housing and final worm drive - no soft pot metal or cast aluminum. •Uses inexpensive 4 conductor cable. •Sealed reed switch sensor technology for reliable all weather readout. •1 degree positioning accuracy - tight tolerances for minimal play. •Rated for large loads even when mounted outside the tower. •Designed for simple mounting to ~2" pipe mast - both ends. •Adaptors available to mate with other common rotator bolt patterns. •Coax can pass through center of rotator - prevents cable damage. •Manual, Automatic, Scanning, and Programmable modes. •Digital readout with 1 degree resolution. •Large easy to read soft green LED display. •Low voltage DC operation from any 12 volt source (typically 2-5 amps). •Ideal for camping, DX'peditions, VHF/UHF rovering. •Generous overtravel (+/-180) with electronic limits. •Programmable limits ideal for side mount applications. •Small front panel to simplify stacking several units takes up less valuable space. •Optional mouse control with 6 user programmable presets. AZ/EL rotator at SP2ZIE for satellite work. •RAU Azimuth rotator, light duty. Small tribanders. •RAK Azumith rotator, medium duty. Larger tribanders. antennas, multiple antennas on same mast. •Big Ring ASR45 Ring rotator, Rohn 45. •Big Ring ASR65 Ring rotator, Rohn 65. •RAS Azimuth/Elevation rotator, medium duty. •Big RAS Azimuth /Elevation rotator, heavy duty. •Rot1 Controller For Azimuth rotators. Computer USB compatible. •Rot2 Controller For AZ/EL rotators. Computer USB compatible. 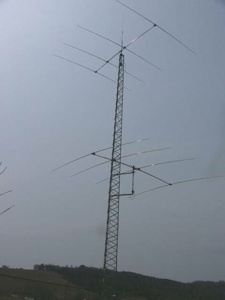 "After using the Alfa-Spid Big RAK for about 9 months, I have to say that it is the best rotator I have used in the 54 years that I have been a ham!" Visit our coax cable page for high quality rotator cables. I have never seen a rotator that so steadied an antenna in spite of 50 mph winds as the Alfa Spid. My antennas do not budge as if there were no wind up there. They are 4 el ement Steppir's on 32 ft booms."